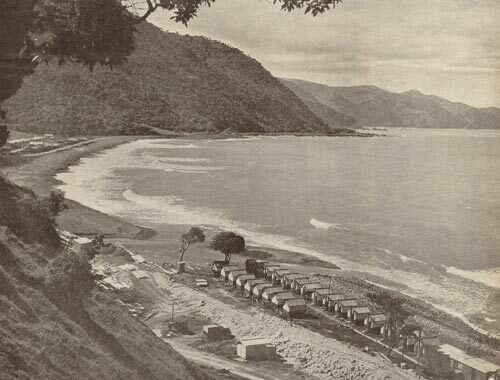 The long-awaited coastal rail link between Marlborough and Canterbury was completed in 1945, the year after this photograph was taken of the railway construction camp at Ōaro, 20 kilometres south of Kaikōura. The single men’s huts are in the foreground and the married men’s quarters just visible at top left. The railway was officially opened on 15 December 1945.